Pinba is a MySQL storage engine that acts as a realtime monitoring/statistics server for PHP using MySQL as a read-only interface. It accumulates and processes data sent over UDP by multiple PHP processes and displays statistics in a nice human-readable form of simple “reports”, also providing read-only interface to the raw data in order to make possible generation of more sophisticated reports and stats. 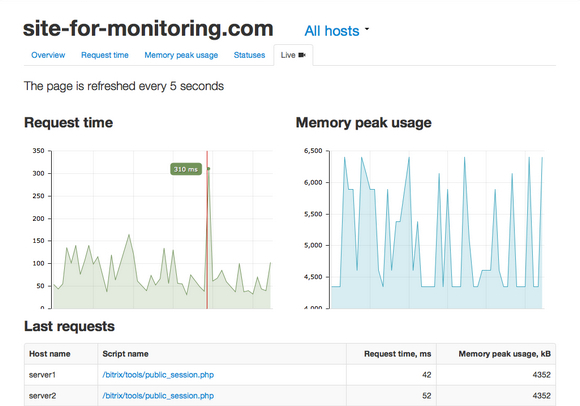 Intaro Pinboard is a simple PHP monitoring system, which aggregates and displays Pinba data. Originally Pinba saves realtime (or nearly realtime) data in own tables. Pinboard periodically dumps this data in own tables and displays core metrics on basis of own data and realtime data from Pinba.